Hello and happy Saturday! I hope you're having a great weekend. Mine has been very busy, but I got lots of things done. Today's card I made for the Mojo Monday sketch challenge week 75. I used one of my new digital images from the Digital Stamp Oasis . Just released it today (along with 5 others)! I love it, it is so much fun to color, and I think my digital artist (and dear husband) did such a wonderful job with it. Just what I had in mind. I printed the image out as a wallet size on Georgia Pacific 110 lb card stock (from Walmart). No heat setting is required. The image was colored with my alcohol markers (I have copics, prismas and blick studio-they are all pretty much the same). The front mushroom and butterfly front wings were cut out and mounted with dimensionals for a 3d look. I added stickles to the caterpillar, the butterfly and the dots on the mushrooms. The blueish looking card stock is actually SU's basic gray stamped with white craft ink using Paisley background stamp. The designer paper is from SU (celery prints), and I used the MS Lace punch to create the border. The sentiment is from SU's retired set Vases in Vogue, one of my faves. I just love the sentiments that are included with the set! Accessories: alcohol markers, prima flowers, brads, eyelets, Martha stewart lace border punch, oval punch, black gingham ribbon, dimensionals. You have some of the most adorable images! 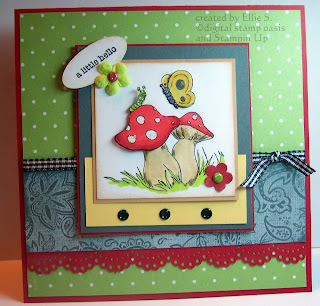 Your card is super cute...love the spring green and bright red colors! very cute card., love the image. OH, you keep outdoing yourself! I just love this card...so wonderful! Now I'm off to see what else you've added! I love your card and the fairy tale feel to it -- great work! Wow that is an adorable stamp and I like the way you colored it. I still need to try some of your digi stamps as they are all cute cute cute, and great for spring! Wow what a great card! Your DH is very talented - lucky you! LOL! TFS ;)! Great card! Off to check out your images now! This is adorable!! Love this! This is such a beautiful whimsical card! You did a super job with the sketch! Great, vibrant color combo on this one. Cute image. I love what you did with the sketch. I like how you turned it and the great colors you used. This is gorgeous, Ellie! Keep those images coming, they are adorable!! Adorable! Great coloring - love it! Just precious! Makes me SO ready for spring! What a great card! I love the image and your layout is divine! Off to check out what other new images you have for us to oogle! Oh my! You have one talented hubby! That image is so cute and your coloring is gorgeous! I love the greens and reds together! This is just adorable, love the colors of this. What a great springy image! Love those 'shrooms. Great coloring job, and the layout is terrific. I've been on a bit of a square card kick myself, lately! love this image. great job on the coloring and the desing of the card. Good luck with your new business, and your search for your design team!